Rec: March 2001, North Transept of the Priory Church of Our Lady and St Cuthbert, Worksop, England. 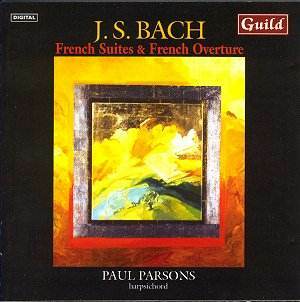 Bach's French Suites are among his most popular works for keyboard, with their attractive melodic material and relative ease of playing compared with some of his other works. As Derek Adlam says in his liner notes: "Each suite has a specific quality and character derived from the �colour� of the key chosen: the first in D-minor is serious and dignified, cantabile lines are emphasised in the second in C-minor. The use of B-minor for the third suite gives Bach an opportunity for writing in a style that is deeply felt and abstracted at one and the same time, a manner which he often associated with this key. The three remaining suites in major keys similarly explore the affekts of key colour. In the mellifluous key of E-flat, the melodic lines of the Allemande soar and fall through an unusually wide compass. When writing in G-major Bach comes closest to the airy grace of true dance music. With the addition of a sixth suite in the bright key of E-major, there is a sense of a brilliant culmination of the whole set." This set includes the French Suites and the French Overture, as well as a Prelude and Fugue in A minor. This is a strange set. There is little in common between the French Suites and the French Overture other than their names. The French Overture is closer to Bach's partitas in style, and is indeed one of the largest keyboard works of his, with a huge opening prelude (over 12 minutes here), which is itself called an overture. Unfortunately, Parsons seems to rush through this great work, with tempi that are beyond what one might call "lively". Especially during the repeats, I had to wonder whether he was trying to get through them as quickly as possible. He offers little variety in his playing of the repeats, making them sound just like copies of the initial parts. Parsons' playing changes when he begins the first French Suite. He sounds more in touch with the music, less hurried, and his phrasing is rounder. But his tempi are still on the fast side, and I can't help but feeling, even as he ends one section and begins another, that he shaves off a couple of beats to get to the end more quickly. At times he plays certain movements in a straightforward manner and in others he ornaments them excessively, trying to make them echo Couperin. He is more successful with some of the slower movements, such as the Sarabande of the C minor suite, where the tempo is more appropriate, but at this slower speed he seems almost unconvinced in the music he is playing. The Ruckers copy used for this recording produces a luscious sound, but at times there are some strange clicking sounds (around 10:43 in the opening movement of the French Overture, for example). This harpsichord has an attractive range, with a smooth-sounding high end, but a bit of weakness in the low end. There is little to recommend in this recording, especially with so many other fine discs of the French Suites and French Overture. Parsons gives little impression of having a plan in playing these works, unless his fast tempi and often exaggerated ornamentation are meant to give them character. Unfortunately these attributes detract from the musicality of the suites, resulting in a disappointing recording. The listener looking for a good recording of the French Suites on harpsichord would do better with Davitt Moroney's recording on Virgin or Blandine Rannou's recent set on Zig-Zag Territoires.